I don't normally make any resolutions for new year's but this year I actually did have one in mind. It's still not a resolution but just a little thought I'll carry with me throughout the year. More of a goal I guess you could say. Either way, my little "goal" for the year was to travel more for personal reasons again. When travelling so much for work I've actually forgotten how much I enjoy travelling for just myself as well (don't get me wrong, I love travelling for work too of course). I'm happy to say that I can kind of half tick off this goal on my list after this little trip to Milan. Although, hopefully this was only the beginning of travelling more for personal reasons this year. I have so many other places I want to visit! I decided to spend the "most romantic day of the year" (I'm not the biggest fan of Valentine's Day there is but hey, I don't think having a day to spread a little bit of extra love is something negative) strolling the streets of Milan, indulging in a ridiculous amount of pasta and passing one million little flower stands on our way – extra pimped out just for this day. We stayed at the beautiful Principe di Savoia hotel while in Milan, feeling like royals even if it was only for a little weekend escape. I'm starting to understand that I have a major weak spot for beautiful hotels, getting changed into a bathrobe the second I've checked in, ordering breakfast in bed and enjoying a bathtub for once (since this is something that barely exists in Paris) – but then again, who doesn't? I also have a weak spot for Italy and this is something that anyone who truly knows me can testify to. I don't know what it is but there's something about the language, the food, the people, the colours. I just love it. Milan is quite different to Rome (a city that is extremely close to my heart) and many people usually say that Milan is quite ugly or "industrial looking" to put it nicely but I have to say that we found so many lovely spots and neighbourhoods in the city this time which made me so pleasantly surprised. I've been to Milan before but only two times and both quite briefly. 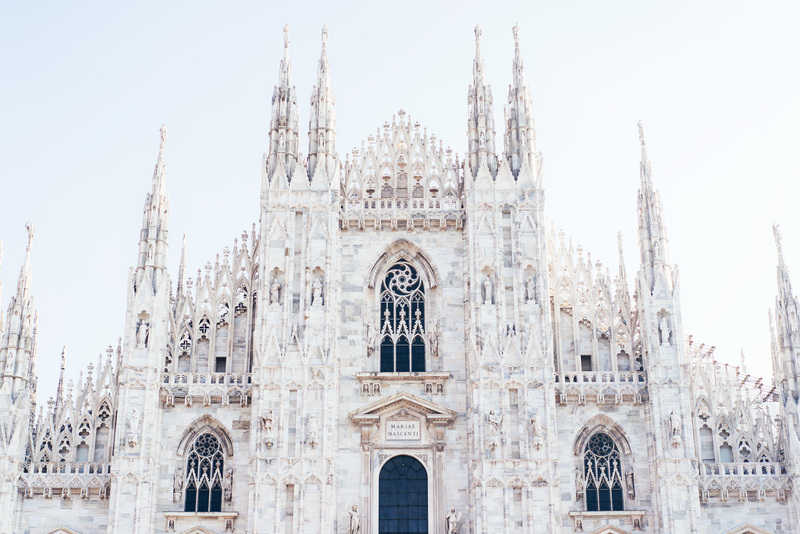 The second time I visited I went to Milan for fashion week, which is a hard time to truly see and discover all the little nooks and corners of a city. I'm so excited about the fact that I made my little promise to myself about travelling more for personal reasons came true so early during the year. I'm also so excited about the fact that I got the opportunity to fall in love with Milan during a couple of days (but don't worry Rome, you still have my heart). I can't wait to come back one day in the future and hopefully stay longer this time and also plan little day trips to nearby favourite locations such as Lake Como and Lake Garda. Bye bye beautiful Milano! For a few suggestions and a couple of places that I managed to hit up while in town, you can have a look at my "Milan Suggestions".